Chase Rice Ignites Live Show with LD Chris Lisle and 4Wall Nashville | Press Center | 4Wall Entertainment, Inc.
NASHVILLE, Tenn. (June 9, 2015) - Country music maverick and "Gonna Wanna Tonight" singer Chase Rice has been honing his live act for years, building up a formidable grassroots following and selling out multiple venues on his headlining Ignite The Night Tour in 2014 before landing an opening spot on Kenny Chesney's The Big Revival Tour this summer. Noted for bringing intensity that is "both never-ending and refreshing" (The Trinity Voice) when he performs, Rice is heating things up even further for The Big Revival Tour with an upgraded lighting rig designed by noted LD Chris Lisle and supplied by 4Wall Nashville. Lisle, who also designed Rice's first touring rig, upped the ante with a new design created to accentuate Rice's trademark on-stage energy and amplify it for larger venues. "Chase is a really fun act to light," said Lisle. "The fans absolutely love him and his energy, and we strive to create a production that accentuates that." The veteran designer knew that being on tour with Chesney would add to the requirements of the rig. The new design would not only need to be impactful in arena and stadium-size venues, but also be able to be moved off stage in minimal time. "We wanted something that would be built into (and onto) the set and that would also be visually effective. We also kept truck space and budget in mind when creating this look," said Lisle. 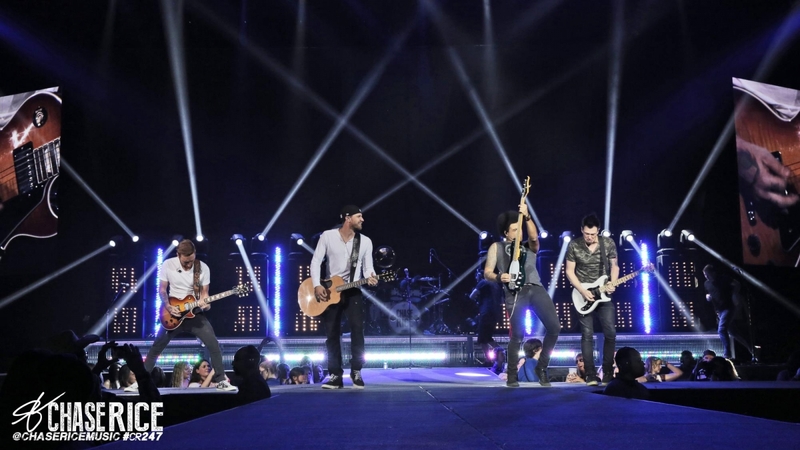 The gear needed to create the look was rented from 4Wall Nashville, who also supplied the equipment for Rice's Ignite The Night Tour. Lisle chose Elation Platinum Beam 5R Extremes, Chauvet Nexus Panels, and Chroma-Q Color Force LED Battens to play key roles in the new plot. Lisle spoke highly of the Nexus panels, and found a clever way to utilize them. "The Nexus panels are hidden in faux guitar cabinets that are on top of set carts," he explained. "For the first several songs, they appear to be just that (amps), but then a couple of songs into the show we turn on the Nexus and they blast that amazing warm white through the grills. It's a great look!" Lisle placed the Color Force LEDs strategically between the cabinets and under risers for eye-candy and punchy looks. The Platinum Beams landed on top of cabinets to create big aerials. Lisle and Rice worked together to fine-tune the look before it hit the road. "Chase is great to work with and has great ideas on what he wants to see. I always send him renderings and drawings during the process so that he is in the loop with the direction, and we go through programming with him to get his notes and ideas," said Lisle. "The whole team from management to crew is great to work with." After being truly involved in the process, Rice himself spoke of the impact of 4Wall on his performances. "4Wall has taken my show to the next level with an unbelievable lighting rig. They've added a whole other dimension to my headlining shows that's versatile enough to look just as great at the stadium shows this year too. And we haven't even gotten to video yet, that will be another level of fun!" Within a few short years of moving to Nashville, country music maverick Chase Rice has already built a loyal fan base across the country through his energetic live shows and gained the attention of industry professionals with his edgy, eclectic sound. Rice's new album, Ignite The Night, was released August 19 on Columbia Nashville/Dack Janiels Records and debuted at No. 1 on Billboard's Top Country Albums and No. 3 on the all-genres chart. With a Platinum-certified, Top 5 hit already under his belt with lead single "Ready Set Roll" and new single "Gonna Wanna Tonight" in the Top 30 and climbing at country radio, Rice continues to perform headlining dates in addition to touring with Kenny Chesney on The Big Revival Tour. For more information, visit www.chaserice.com or follow on Twitter @ChaseRiceMusic and www.Facebook.com/ChaseRiceMusic. 4Wall is a national provider of professional entertainment lighting equipment for stage, studio, and corporate use. Specializing in rentals, sales, and system integration, 4Wall provides the solutions to your lighting needs by pairing an inventory comprised of the latest technology with outstanding customer service and support. For more information, browse our site or follow on Twitter and Instagram @4Wall_Lighting.